Toyin Ojora-Saraki: “Most primary health centers in Nigeria lack good washing facilities. At the Lugbe PHC, there is no washing sink in the labor room, so water has to be fetched from the tap outside and brought to the mother. A health worker who wants to wash her hands will have to fetch a bucket. 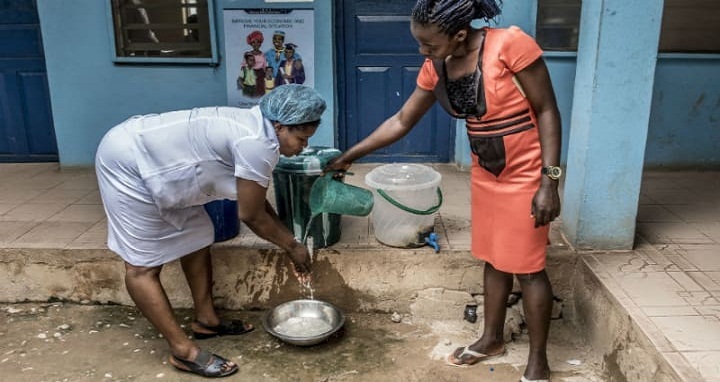 It is not possible for us to do our jobs as midwives without access to water, sanitation, and handwashing stations,” Rita Momoh, a midwife, explains. Rita lives the everyday challenges caused by the absence of the single most fundamental requirement for basic health care: access to safe drinking water, sanitation, and hygiene in health care facilities around the world. Hundreds of thousands of midwives and other health care professionals work in similar conditions. Rita’s experience is backed up with startling data from the Water Institute at the University of North Carolina. In an analysis of 129,000 health care facilities in the developing world, researchers found more than 65 percent of facilities lack both running water and soap for handwashing. Data from a subset of six countries — Bangladesh, Haiti, Malawi, Nepal, Senegal, and Tanzania — revealed that only 2 percent of their health care facilities have concurrent access to water, sanitation, hygiene, and waste management services. This on-the-ground reality results in the inability to implement the most basic infection control measures, a situation that not only endangers patients and staff, but also presents a danger to all of us. Health facilities are the epicenters for pandemic containment, but the lack of WASH contributes to further spread of disease, such as the recent outbreak of Lassa fever in West Africa attests. When it comes to patients, among the most vulnerable are pregnant women and newborns, both at great risk of sepsis — a leading cause of death in hospitals. WaterAid found that half the primary health facilities it surveyed in Nigeria did not even have handwashing facilities in delivery rooms. Midwives like Rita live that reality daily. The organization I founded, the Wellbeing Foundation Africa, interviewed midwives across Nigeria, who told us about delivering babies under appalling conditions that put the lives of infants and mothers at risk. The scope of this problem extends far beyond Nigeria, of course, to a majority of health care facilities in developing countries throughout Africa, Asia, Latin America, and the Middle East. We know that access to WASH in health care facilities is a major global problem, one that is readily solvable, but largely ignored by the international community — until recently. In March, United Nations Secretary-General António Guterres recognized the need to address this urgent health concern with the launch of the Water Action Decade and his call to action in which he specifically challenged the global community to achieve universal WASH access in all health care facilities by 2030. The World Health Organization and the U.N. Children’s Fund will lead the global charge. But they cannot achieve success without every one of us. Every person and organization dedicated to better, safer, and more humanitarian health care needs to consider the health workers and their patients whose access to safe health care is deeply diminished by inadequate WASH services. Regardless of how many vaccines a health care facility has, or how new its technology is, it can never be effective without providing the most basic service of all: WASH. By introducing adequate WASH services in health care settings, we can thwart preventable deaths and achieve universal health coverage. We must all meet the challenge issued by the U.N. secretary general’s call to action. To start, we must elevate this issue within our own health and WASH programming; reach out to the community leaders with whom we all work; and support local, regional, and national governments and multilateral organizations in their response to the call to action. For example, the Wellbeing Foundation Africa works with Nigerian ministries and agencies, along with WHO, in their commitment to adequate WASH services in health care facilities throughout Nigeria. This fundamental issue is one that is solvable, but it will not be solved by any single sector. Health, development, finance, and government must commit. More specific action items include: using WHO’s washinhcf.org website for resources and exemplars to model your programming; capturing lessons learned and documenting best practices for data sharing; advocating for increased financing for WASH in health care facilities; and utilizing a risk-based management approach and a health systems approach by implementing WHO and UNICEF’s WASH FIT tool. Moreover, USAID and other development institutions should insist that every health care facility they are involved with has access to WASH, or a clear, financed plan to make that happen. As we join the international community on May 5 in observing World Hand Hygiene Day and the International Day of the Midwife, it’s clear the themes of both days are deeply interconnected. We in the global health and development communities can no longer stand by in silence while mothers and newborns die from preventable and unnecessary complications, simply because the most basic of WASH services are not available. Her Excellency Toyin Ojora-Saraki founded the Wellbeing Foundation Africa in 2004 to combat the scourge of preventable maternal and newborn death, both in her home country of Nigeria, and across Africa. A long-time advocate for midwives and frontline health workers as the first line of defense against maternal and newborn morbidity and mortality, Toyin launched the United Nations Secretary General’s Every Woman, Every Child Initiative in Nigeria in 2011, and was named Inaugural Global Goodwill Ambassador for the International Confederation of Midwives in 2014.